As relatively small and new Guitar Company which has developed from, and continues to work alongside, a busy Guitar Teaching Studio, it is always a pleasure to work with new and emerging talent to help us project our respective brands. Therefore, following recent discussion we are very pleased to extend a very warm welcome to Alessandro Dionisio from Italy who joins us as our latest Endorsed Artist. 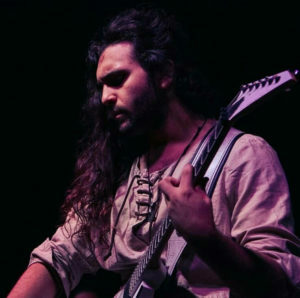 Alessandro is the guitarist from the Italian Folk/Death Metal band KormaK, based in Bari, Italy. The band was formed in 2017 and released their debut album “Faerenus” in 2018 available on Digital Platforms Worldwide including Spotify, Bandcamp. Kormak have big plans for 2019 including the recording of their second Album and a European Tour. We’ll keep you up to date on latest developments on Alessandro’s Artist page, in the meantime enjoy “The Goddess’s Song” from their debut Album “Faerenus”. Alessandro plays a very limited Production Edition Cassidy Axeman Series AX501 7 String / Through neck beast of a guitar – watch this space!